National Association of State Directors of Career Technical Education Consortium (NASDCTEc) was established in 1920 to represent the state and territory heads of secondary, postsecondary and adult Career Technical Education (CTE) across the nation. NASDCTEc, through leadership, advocacy and partnerships, supports an innovative CTE system that prepares individuals to succeed in education and their careers and poises the United States to flourish in a global, dynamic economy. 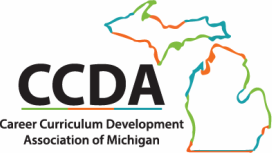 The Career Education Planning District (CEPD) Council was established in 2009 with the Michigan Association of Career and Technical Education (ACTE Affiliate) and the Michigan Department of Education – Office of Career and Technical Education. Initiatives include legislative initiatives, concurrent/direct credit/articulation with post-secondary institutions, Michigan Economic Development Council, STEM Programming, and teacher/administrator training. The Michigan Academic Career Tech Education Consultant (MACTEC) group is a professional organization whose goal is to provide a foundation for improving the academic education of students in Michigan’s CTE programs. The Michigan Career Placement Association is a professional organization whose goal is to provide direction, placement, and leadership services to all personnel who assist in the placement of all students into work-based learning experiences..
Materials 2017 - Please see presentation and supportive documents below. Materials 2016 - Visit this Google Drive folder to view career readiness resources. Materials 2015 - Please go to Literacy tab to see the Literacy Resources. This is the main page for the OCTE. And includes contact information and a current items section. Additional Resources: Entering Student ID's, implemented assessments, CEPD Map/Directory/Lookup, Which students must be assessed & when? etc. CIP Program Endorsements for CTE Instruction (identifies IOC/OEC's that apply to each CIP), etc. Programs: State Continuing Education Clock Hours (SCECH)/ Secure Central Registry (SCR), etc. MOECS is a secure web-based system that allows educators to register and create private accounts and have access to all of their certification data, apply for certificates and endorsements, and renew their certificates.